Good grief, it's gorgeous. The New York Times just unveiled the slickest exoplanet animation/infographic we've laid eyes on. Go check it out. Now. We've included a screenshot up top, but it doesn't come anywhere close to doing it justice. 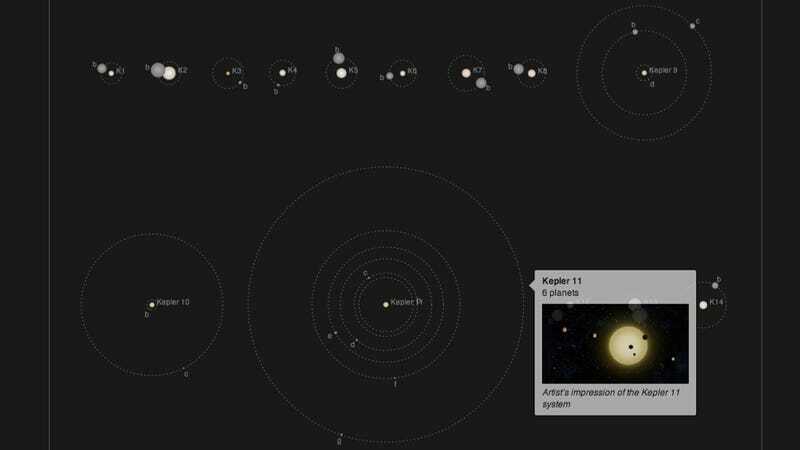 The animation includes every single one of Kepler's exoplanetary discoveries with a known size and orbit (including five planets orbiting Kepler 62, and two orbiting Kepler 69, planetary systems just announced this afternoon), all of which are depicted at their relative distances and periods. In motion! With color-coded star temperatures! And hover-over links to articles and artist depictions! We can't feature it here, because it's animated, interactive, and requires a fair bit of scrolling to see it all. But trust is. This is something you need to see.